Michael Oliver will take charge of the FA Cup final between Chelsea and Manchester United at Wembley Stadium. 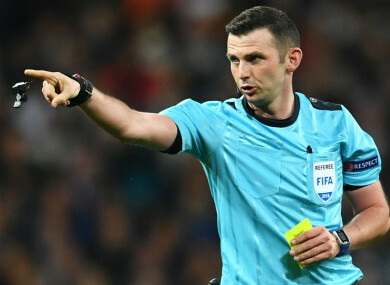 FA CUP FINAL referee Michael Oliver was humbled by messages of support after experiencing a “weird few days” in the aftermath of Juventus’ controversial Champions League exit at the hands of Real Madrid. The Durham official was the centre of attention after awarding a late penalty to the hosts in the second leg of the quarter-final tie at the Santiago Bernabeu. Oliver’s decision to blow for a foul by Medhi Benatia on Madrid substitute Lucas Vazquez led to a furious reaction from Juve goalkeeper Gianluigi Buffon, who was sent off for his vociferous protestations. Cristiano Ronaldo scored from the spot to send the holders through, with Oliver and his wife subsequently the target of death threats and social media abuse from upset fans. “It was a weird few days. But it was nice that so many people, both within the game and outside the game, were keen to offer their support. It was quite humbling actually and it meant a lot,” he told the Football Association’s official website. I had people coming up to me in the street and people from inside the game were sending me messages of support. It’s a nice thing to know I’ve got that backing. The FA has handed Oliver the FA Cup final between Chelsea and Manchester United on 19 May. He will be assisted by Lee Betts and Ian Hussin, with Lee Mason the fourth official. Neil Swarbrick, meanwhile, will make history as the first video assistant referee at an FA Cup final. “I was very proud and humbled to receive the phone call,” Oliver added. “When you start out, taking charge of the Cup Final is not something you even think about. As your career progresses it becomes a realistic target but it’s not a call you ever expect to take. This opportunity only comes around once in a referee’s career. Email “'It was a weird few days': FA Cup final ref Oliver reflects on Buffon incident”. Feedback on “'It was a weird few days': FA Cup final ref Oliver reflects on Buffon incident”.